There is currently a gap between the emerging capacity of conveying emotional aspects within multi-modal interaction and the growing expectations of people for a more natural and pervasive interaction with digital media applications in intelligent adaptive spaces. CALLAS aims to design and develop a Framework based on a plug-in multimodal architecture, invariant to configuration of Multimodal Components, to interpret and process emotional aspects in real-time for easy and fast development of applications for Art and Entertainment, paying attention to the value of users, who are no longer passive spectators of artistic performances, but stimulating sources of human communication. The project is developing selected scenarios for Art and Entertainment, to showcase the technology and to validate the approach to computing the aesthetic user experience in different typologies of space: theatres, home, squares, festivals, etc., as the "space" is one of the most interesting factors where human emotional interaction takes place. A strong attention is given to all interface and interaction aspects, to minimize the complexity for multimodal handling, to make creative industries and artists free to develop truly interactive art, keeping the technology burden hidden and preserving the naturalness of user interaction, not altering the spontaneity of their experience. Proof-of-Concepts are also implemented to evaluate the emotional experience of audiences and specific deployments. The blend of competencies represented by the partners of the CALLAS Consortium set the baseline for a success, supported by the participation of external members, complementing the understanding of the requirements of artists, amateurs, technologists, performers and potential early adopters of the technology. Vital to the project is the C³: the CALLAS Community Club, a social network where discussion threads are open, opinions shared, synergy with project developments and technology evaluation is kept , aimed to maximise the adoption and to debate on research topics and its applications. 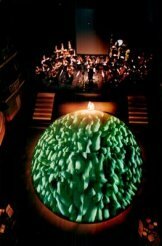 Special disseminations events reinforced the opportunity to cooperate with stakeholders: in Palermo 4/May/07 in conjunction with the 110th anniversary of the Fondazione Teatro Massimo and in RomeÂ at Accademia Nazionale di Santa Cecilia on 9-10/Sept/09 during CIMCIM2009.